You'll be £25.00 closer to your next £10.00 credit when you purchase British Railways in the 1960s: Southern Region. What's this? After the Second War, Britains railways were rundown and worn out, requiring massive investment and modernisation. The Big Four railway companies were nationalised from 1948, and the newly formed British Railways embarked on a programme of building new Standard steam locomotives to replace older types. These started to come on stream from 1951. This programme was superseded by the 1955 scheme to dieselise and electrify many lines and so the last loco of the Standard types was built in 1960 and the steam locomotives had been swept entirely from the BR network by 1968. 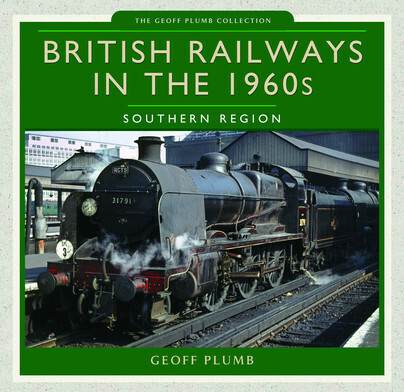 This series of books, 'The Geoff Plumb Collection', is a photographic account of those last few years of the steam locomotives, their decline and replacement during the transition years. Each book covers one of the former Big Four, the Southern Railway, London Midland & Scottish Railway, Great Western Railway and London & North Eastern Railway, including some pictures of the Scottish lines of the LMS and LNER. The books are not intended to convey a complete history of the railways but to illustrate how things were, to a certain extent, in the relatively recent past and impart some information through comprehensive captions, which give a sense of occasion often a last run of a locomotive type or over a stretch of line about to be closed down. The photos cover large parts of the country, though it was impossible to get everywhere given the overall timetable of just a few years mainly when the author was still a schoolboy with limited time and disposable income to get around. Pictures are of the highest quality that could be produced with the equipment then available, but they do reflect real life and real times. In simple terms, a look at a period not so long ago but now gone forever. A top transport book in every sense. A superb photographic celebration of a steam era that ended exactly 50 years ago. For many southern steam enthusiasts, this publication is a real treat. All the favourite main players are well represented – Bulleid's impressive Merchant Navy Pacifics – plus his lighter Pacifics, the equally charismatic West Country and Battle of Britain Classics. The BR Standard Classes are well in evidence, but the book also features many of the, by then, rapidly diminishing older pre-grouping classes. In a mic of colour images and black and white – with the majority being in colour – it abounds with a rich assortment of locomotives and locations. All the images are full size and in good quality – and superbly convey the nostalgic atmosphere of the last years of Southern Steam. The latest in the brilliant series of Geoff Plumb's photographic collection showing the last days of British Railways steam, some in glorious colour, the majority in black and white. An amazing collection. The author has chosen a splendid number of photographs, 143 in color and 17 in black and white, which reflect to a greater or lesser extent and with great fidelity, the end of a period close to transition. A collection of truly stunning photographs. Geoff is a lifelong railway enthusiast, born in Sheffield in March 1949. From an early age he took thousands of photos, the vast majority in colour, documenting the decline and fall of steam locomotives. Geoff's interest in photography led to his forty plus years career in television, starting with London Weekend TV as a cameraman in 1968, later with Granada TV and finally as a freelance lighting cameraman. Many of Geoff's photos have been published in magazines, such as The Railway Magazine and Steam Railway, and in books including Red Panniers Last Steam on the Underground. The Royal Mail has even used a couple of his photos on specialist stamp issues! Geoff has an active photo gallery website at www.plumbloco.co.uk where many of his pictures can be seen.